Increasingly sophisticated technology and an ever-expand-ing base of knowledge have not been enough to allow humans to halt the worldwide progression of environmental degradation. Extensive fieldwork in both Africa and the United States convinced Allan Savory that neither the forces of nature nor commonly blamed culprits-overpopulation, poor farming practices, lack of financial support-were causing the decline of once-healthy ecosystems. He also noted that once land has become degraded, leaving it alone seldom helps revitalize it. 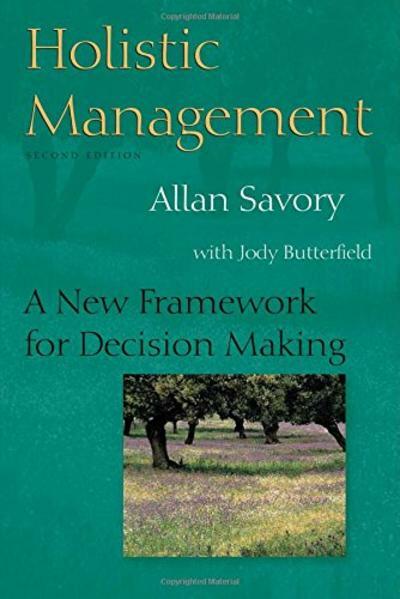 Savory eventually came to realize that on the most fundamental level, environmental problems are caused by human management decisions, and only through wholesale changes in the way decisions are made can functioning ecosystems be restored. In response to that startling discovery, Savory began to develop a revolutionary new approach to decision-making and management. Known initially as Holistic Resource Management, and now as simply Holistic Management, it considers humans, their economies, and the environment as inseparable. It includes a common-sense decision-making framework that requires no specialized knowledge or elaborate technology to utilize, and is applicable in any environment or management situation. At the heart of the approach lies a simple testing process that enables people to make decisions that simultaneously consider economic, social, and environmental realities, both short- and long-term.Holistic Management is a newly revised and updated edition of Holistic Resource Management (Island Press, 1988), which was the first book-length treatment of Savory's decision-making framework and how it could be applied. A decade of trial-and-error implementation has strengthened and clarified the book's ideas, and has expanded the scope of the process to include all manner of decisions and management situations, not just those that relate to land and resource management. Holistic Management has been practiced by thousands of people around the world to profitably restore and promote the health of their land through practices that mimic nature, and by many others who have sought a more rewarding personal or family life. This book is an essential handbook for anyone involved with land management and stewardship-ranchers, farmers, resource managers, and others-and a valuable guide for all those seeking to make better decisions within their organizations or in any aspect of their personal lives.